This variety pack of rustic soap party favors can be customized to fit all your party needs. They are great for wedding favors, bridal showers, baby showers, and any party! They weigh approximately 2 oz each. Will come packaged in clear cello, natural raffia, and a card stock gift tag that matches the soap color. The tag can include a few words of your choice to memorialize your special occasion. Just leave in the comments section at check out or email me what you want on the tag at littlesoapstore@yahoo.com. 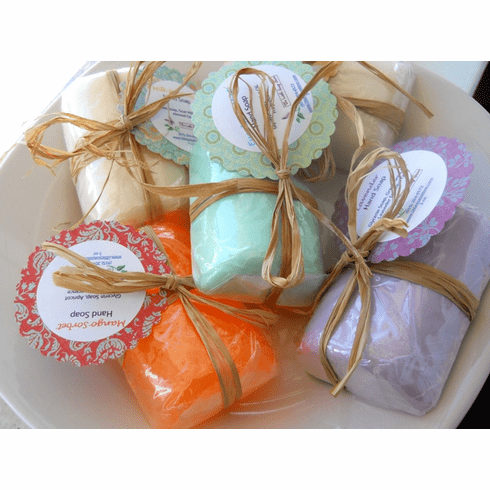 These are all detergent and SLS-free glycerin soaps with added oils to enhance their skin benefits. If you want 20 of one kind of scent just let me know at check out. We also do custom colors/scents. Please email/call us for more info. We do take rush orders, but email or call me first to see if I can accommodate your needs. I don't charge extra for this because I always I try to be as flexible with my customers as I can. Depending on the situation, you may have to pay a little extra for any rush shipping fees that USPS may charge.